This is the softroll cluster from Fortune Bakeshop which is my snack yesterday! 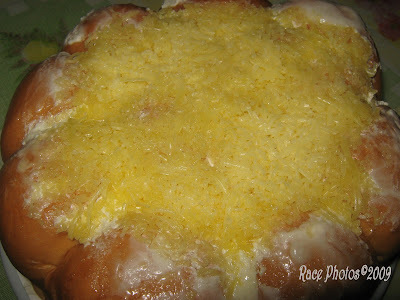 Actually it's something like a bunch of ensaymada full of cheese toppings that's why I love having it as merienda. There are varieties of this one which I buy at Mercury Convenience Store, they have Choco Roll cluster too! my friend has been asking about Fortune Bakeshop because we couldn't find any in Megamall. good thing you mentioned Mercury convenience store, we'll check it out. thanks for sharing. Ensaymada with coffee, that will make my day! ako din, i buy that most of the time kapag napapadpad ako sa mercury, okay naman kasi ung price at lasa. That's a hearty merienda. I love the cheese on it. fortune bakeshop, sila ba yung pinaka masarap na hopia sa cebu? Yummy Ensaymada esp. pag may cheese!